Look at these grey circles. They look bent, right? Like somebody put a ring in a vice and squeezed it? Actually, it's just an incredible optical illusion courtesy of @SciencePorn. 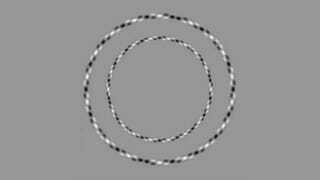 Both circles are perfectly round. Really. No really. If you squint hard at the image, you can see the rings come their true, circular selves. How amazing and discombobulating! For more optical illusions, see this Gizmodo roundup.